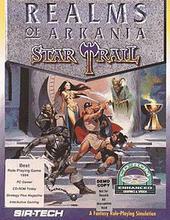 Star Trail is the second game of the RPG series, and voted by many fans as the best of them all. You start the game in a temple in Kvirasim dedicated to the goddess Peraine. Here you create the 6 heroes you play in the game. You can either choose to let the computer make your characters, load the sample characters or create your own. There is a total of 12 different classes you may play. Each one with its own different style and magic ability. This bit of the game can be difficult for new players, who might want to let the computer take care of the birth of the heroes. When you are done in the temple, the game begins! Immediately you will come in contact with two persons, who will tell you their tale and send you out on a hunt to find an ancient artefact: The Salamander Stone. From this point it is up to you. The game is filled with mini-quest for you to complete, and a vast map to explore. So the chance for you to get bored with this game is minimal. There is always something new to discover, even for advanced players. The music in the game is excellent, and improves the gameplay by a great deal. Also the graphics are great for the time. It’s not 3D, but in my humble opinion it’s the second best. Star Trail is an extremely difficult game. If you do not listen to warnings from people you meet, or travel too deep into orc-infested territory… You will either die, get captured or find a point of no return. The game rely a great deal on its manual, and playing the game without it will greatly increase the difficulty… but it’s not impossible. A separate speech pack for the floppy version adds several megabytes of digitized speech to the game, including dialogue for animated sequences and magic incantations during gameplay. The CD-ROM release includes the speech already.